Performance is a key requirement for any application or piece of code that you develop. The browser helps with client-side caching of text and images, whereas the server-side caching you choose to implement is vital for creating the best possible performance. Caching is the process of storing frequently used data on the server to fulfill subsequent requests. You will discover that grabbing objects from memory is much faster than re-creating the Web pages or items contained in them from scratch each time they are requested. Caching increases your application's performance, scalability, and availability. The more you fine-tune your application's caching approach, the better it performs. This article focuses on the new SQL invalidation caching capabilities that ASP.NET 2.0 provides. When you are using SQL cache invalidation, if the result set from SQL Server changes, the output cache can be triggered to change. This ensures that the end user always sees the latest result set, and the data presented is never stale. This feature was frequently requested by developers using ASP.NET 1.0/1.1, so the ASP.NET team worked hard to bring it to ASP.NET 2.0. To utilize the new SQL Server Cache Dependency feature in ASP.NET 2.0, you must perform a one-time setup of your SQL Server database. To set up your SQL Server, use the aspnet_regsql.exe tool found at C:\Windows\Microsoft.NET\Framework\v2.0xxxxx\. This tool makes the necessary modifications to SQL Server so that you can start working with the new SQL cache invalidation features. Enable your database for SQL Cache Dependency support. Enable a table or tables for SQL Cache Dependency support. Include SQL connection string details in the ASP.NET application's web.config. Programmatically creating a SqlCacheDependency object in code. Adding a SqlCacheDependency instance to the Response object via Response.AddCacheDependency. connection string with the -c option instead. -ed                       Enable a database for SQL cache dependency. -dd                       Disable a database for SQL cache dependency. -lt                       List all tables enabled for SQL cache dependency. The following sections show you how to use some of these commands. To use SQL Server cache invalidation with SQL Server 7 or 2000, begin with two steps. The first step enables the appropriate database. In the second step, you enable the tables that you want to work with. You must perform both steps for this process to work. If you want to enable your databases for SQL cache invalidation and you are working on the computer where the SQL Server instance is located, you can use the following construct. If your SQL instance is on another computer, change localhost in this example to the name of the remote machine. From this command prompt, you can see that we simply enabled the Northwind database (the sample database that comes with SQL Server) for SQL cache invalidation. The name of the SQL machine was passed in with -S, the username with -U, the database with -d, and most importantly, the command to enable SQL cache invalidation was -ed. Now that you have enabled the database for SQL cache invalidation, you can enable one or more tables contained within the Northwind database. You can see that this command is not much different from the one for enabling the database, except for the extra -t Customers entry and the use of -et to enable the table rather than -ed to enable a database. Customers is the name of the table that is enabled in this case. After the table is enabled, you can begin using the SQL cache invalidation features. However, before you do, the following section shows you what happens to SQL Server when you enable these features. Now that the Northwind database and the Customers and Products tables have all been enabled for SQL cache invalidation, look at what has happened in SQL Server. If you open up the SQL Server Enterprise Manager, you see a new table contained within the Northwind database-AspNet_SqlCacheTablesForChangeNotification (whew, that's a long one!). Your screen should look like Figure 1. At the top of the list of tables in the right-hand pane, you see the AspNet_SqlCacheTablesForChangeNotification table. This is the table that ASP.NET uses to learn which tables are being monitored for change notification and also to make note of any changes to the tables being monitored. The table is actually quite simple when you look at the details, as illustrated in Figure 2. In this figure, you can see three columns in this new table. The first is the tableName column. 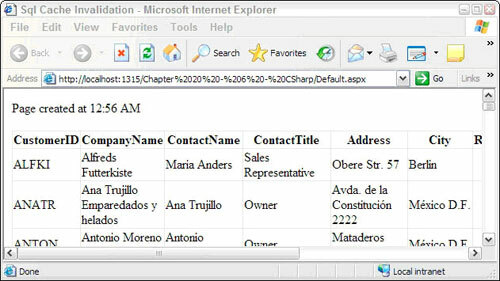 This column simply shows a String reference to the names of the tables contained in the same database. Any table named here is enabled for SQL cache invalidation. The second column, notificationCreated, shows the date and time when the table was enabled for SQL cache invalidation. The final column, changeId, is used to communicate to ASP.NET any changes to the included tables. ASP.NET monitors this column for changes and, depending on the value, either uses what is stored in memory or makes a new database query. Now that you know how to enable your SQL Server database for SQL Server cache invalidation, take a look at how you remove the capability for a specific table to be monitored for this process. To remove a table from the SQL Server cache invalidation process, use the -dt command. You can see that all you do is specify the name of the table using the -t command followed by a -dt command (disable table). The command line for disabling table caching will again list the tables that are enabled for SQL Server cache invalidation; this time, the Products table is not listed — instead, Customers, the only enabled table, is listed. Not only can you pick and choose the tables that you want to remove from the process, but you can also disable the entire database for SQL Server cache invalidation. In order to disable an entire database, you use the -dd command (disable database). 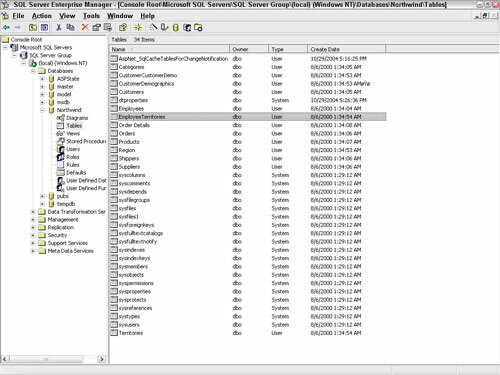 Note that disabling an entire database for SQL Server cache invalidation also means that every single table contained within this database is also disabled. Disabling the database for SQL cache dependency. method, or the command line tool aspnet_regsql.exe. If you now open the Northwind database in the SQL Server Enterprise Manager, you can see that the AspNet_SqlCacheTablesForChangeNotification table has been removed for the database. As you've seen, standard SQL Server 2000 cache invalidation uses a table-level mechanism using a polling model every few seconds to monitor what tables have changed. SQL Server 2005 supports both programmatic and declarative techniques when caching. Use the string "CommandNotification" in the OutputCache directive to enable notification-based caching for a page as in this example. You can specify SQL caching options programmatically or declaratively, but not both. Note that you must first call System.Data.SqlClient.SqlDependency.Start, passing in the connection string, to start the SQL notification engine. As data changes within SQL Server 2005, SQL and ADO.NET automatically invalidate data cached on the Web server. After you enable a database for SQL Server cache invalidation and also enable a couple of tables within this database, the next step is to configure your application for SQL Server cache invalidation. To configure your application to work with SQL Server cache invalidation, the first step is to make some changes to the web.config file. In the web.config file, specify that you want to work with the Northwind database, and you want ASP.NET connected to it. Listing 1 shows an example of how you should change your web.config file to work with SQL Server cache invalidation. The pollTime attribute isn't needed if you're using SQL Server 2005 notification. From this listing, you can see that the first thing established is the connection string to the Northwind database using the <connectionStrings> element in the web.config file. Note the name of the connection string because it is utilized later in the configuration settings for SQL Server cache invalidation. The SQL Server cache invalidation is configured using the new <caching> element. This element must be nested within the <system.web> elements. Because you are working with a SQL Server cache dependency, you must use a <sqlCacheDependency> child node. You enable the entire process by using the enabled="true" attribute. After this attribute is enabled, you work with the <databases> section. You use the <add> element, nested within the <databases> nodes, to reference the Northwind database. The following table explains all the attributes of the <add> element. Name The name attribute provides an identifier to the SQL Server database. 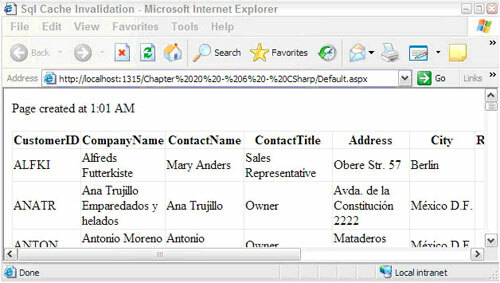 connectionStringName The connectionStringName attribute specifies the name of the connection. Because the connection string in the preceding example is called AppConnectionString1, you use this value for the connectionStringName attribute as well. pollTime The pollTime attribute specifies the time interval from one SQL Server poll to the next. The default is .5 seconds or 500 milliseconds (as shown in the example). This is not needed for SQL Server 2005 notification. Now that the web.config file is set up correctly, you can start using SQL Server cache invalidation on your pages. ASP.NET makes a separate SQL Server request on a completely different thread to the AspNet_SqlCacheTablesForChangeNotification table to see if the changeId number has been incremented. If the number is changed, ASP.NET knows that an underlying change has been made to the SQL Server table and that a new result set should be retrieved. When it checks to see if it should make a SQL Server call, the request to the small AspNet_SqlCacheTablesForChangeNotification table has a single result. With SQL Server cache invalidation enabled, this is done so quickly that you really notice the difference. Now that the web.config file is set up and ready to go, the next step is to actually apply these new capabilities to a page. For an example of a page using the new SQL Server cache invalidation process, look at Listing 2. The value of Northwind:Customers specifies that you want the SQL Server cache invalidation enabled for the Customers table within the Northwind database. The Duration attribute of the OuputCache directive shows you that, typically, the output of this page is stored in the cache for a long time-but this cache is invalidated if the Customers table has any underlying changes made to the data that it contains. A change to any of the cells in the Customers table of the Northwind database invalidates the cache, and a new cache is generated from the result, which now contains a new SQL Server database request. Figure 3 shows an example of the page generated the first time it is run. From this figure, you can see the contents of the customer with the CustomerID of ALFKI. For this entry, go to SQL Server and change the value of the ContactName from Maria Anders to Mary Anders. Before SQL Server cache invalidation, this change would have done nothing to the output cache. The original page output in the cache would still be present and the end user would still see the Maria Anders entry for the duration specified in the page's OuputCache directive. Because of SQL Server cache invalidation, after the underlying information in the table is changed, the output cache is invalidated, a new result set is retrieved, and the new result set is cached. When a change has been made, you see the results as shown in Figure 4. Notice also that the text "Page created at" includes an updated time indicating when this page was rendered. Need to stop working so late, eh? The preceding example shows how to use SQL Server cache invalidation for a single table on the ASP.NET page. What do you do if your page is working with two or more tables? Scott Hanselman is a co-author of Professional ASP.NET 2.0 Special Edition (Wrox, 2006, ISBN: 0470041781), as well as the best-selling predecessor to that title, Professional ASP.NET 2.0 (Wrox, 2005, ISBN: 0764576100). This article is excerpted from Chapter 22, "Caching," from Professional ASP.NET 2.0 Special Edition. Prior to his recent move to Microsoft, Scott was the chief architect at the Corillian Corporation, an eFinance enabler and he was both a Microsoft RD (regional director) as well as an MVP for both ASP.NET and Solutions architecture. He has more than 14 years of experience developing software in C, C++, VB, COM, and certainly VB.NET and C#. His Computer Zen blog is one of the more popular developer blogs on the Web. Scott's other articles featured on Wrox.com are Generating Custom XML from SQL 2005, also from Professional ASP.NET 2.0 Special Edition and Two ASP.NET HttpHandler Image Hacks, excerpted from his contribution to the book, ASP.NET 2.0 MVP Hacks and Tips (Wrox, 2006, ISBN 0764597663). Scott is also featured on Wrox.com in a series of 4 developer videos on the topic of developer productivity.